MasungiGeoreserve is in Baras, Philippines. 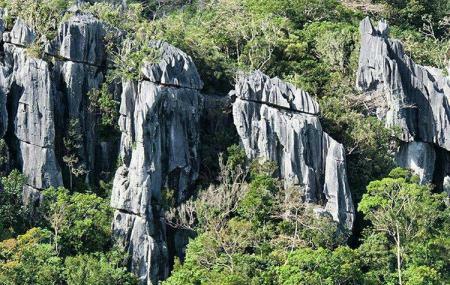 It gets its name from the Masungi Rock formations that the park centers around. Aiming to give a natural holistic experience, the reserve boasts of limestone peaks, lush rainforests and caves too. You can also spot a variety of faunalike snakes, monkeys, civets and various species of birds and insects. The complete trail of this reserve takes around four hours. Attractions within the sanctuary include the best vantage point to view Laguna de Bay- the largest lake in Philippines, caves, spectacular peaks connected by bridges, air house and a reflection pond. To personalise your visit to the city, you can use an all-inclusive Baras trip planner for the same that will give detailed information about visiting the city. Fine Accommodation options like Majestic Puraran Beach Resort, Pacific Surfers Paradise Beach Resort and Puraran Beach House will meet your requirement of where to stay in Baras. Chalk out the best way to discover the city with Baras vacation packages. Check out various modes for how to reach Baras. Love this? Explore the entire list of places to visit in Baras before you plan your trip. Fancy a good night's sleep after a tiring day? Check out where to stay in Baras and book an accommodation of your choice. How popular is Masungi Georeserve? People normally also visit Sm Ice Skating while planning their trip to Masungi Georeserve. People also prefer to start their day with Masungi Georeserve. A bit hard to get to if you don't have your own car. But it's worth it, for sure. Also a bit expensive, but it's for the maintenance of the place. You can really feel that the environment is protected and well taken care of and the guides know their stuff. (It wouldn't be this expensive if the government allocates enough funds for our environment and natural resources, so these places don't have to resort to their own income generation, but what else can you do? Just try to support them, I guess). ANYWAY, beginner-friendly hike. Lots of fun obstacles. There's a part in the middle where the guide asks you to stay silent so you can meditate amidst nature and makes you appreciate it more. But I think he just wanted us to shut up, lol. We were definitely chatty most of the hike. We were there for about 3-4 hours because it rained heavily. And trust me, the hike won't be cancelled even if it's pouring rain. They just provide you with fashionable ponchos. Super nice getaway when you have had too much of the city. Really great tour with a super friendly guide. It's not just the climbing on the nets part that you know from all the pictures on the internet. The tour has a lot more to offer: there's also hiking through mountain forests, and a cave with stalactites and stalagmites. When you have climbed the different rock formations you are greeted with an amazing view of the green mountains. The 3-4 hour tour was over in a flash. We didn't even notice the time go by. Very nice experience. Would recommend to anyone! I highly recommend this place for adventure lovers. One hour drive from Manila. You need to do online reservations one month in advance as this place is always full coz they only allow limited tourist groups in a day. Complete tour takes 3-5 hour based on your group speed and skills. Trekking, rope climbing, rappelling and many other adventures. Be careful with your phone and other valuables. A really nice and pleasant place to visit. Very well thought of and nature is really being taken care of. The hike itself is pretty long but if you come with friends you will have fun. The people people who work there are also very friendly and the snack after the hike is also very good. Giving it 5 stars over all. It's a soul refreshing activity for everyone. It's tiring but challenging. You will sweat a lot. You will also gain knowledge of its history. If you're a nature lover, it is for you. On the other hand if you have a fear of heights it will be more challenging.